Vacuum Ultraviolet (VUV) to Ultraviolet (UV) Optical Windows are available from select VUV Grade Magnesium Fluoride (MgF2); Calcium Fluoride (CaF2) & Sapphire. 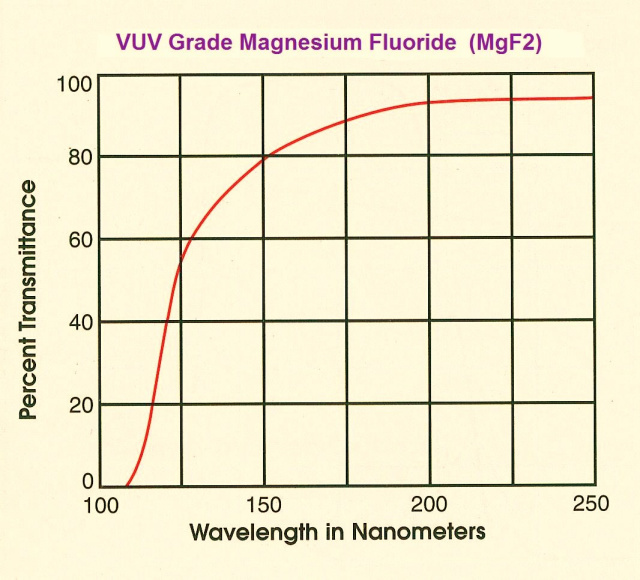 Magnesium Fluoride: VUV Grade Magnesium Fluoride (MgF2) exhibits high transmission properties from ~ 110nm Vacuum UV (VUV) to ~ 6.0um in the Infrared. MgF2 is a relatively hard crystalline material resistant to mechanical and thermal shock. MgF2 is a birefringent crystal typically oriented along the optical axis to avoid birefringent effects in optical windows & lenses. MgF2 Axis Orientation is within +/- 5 degrees. 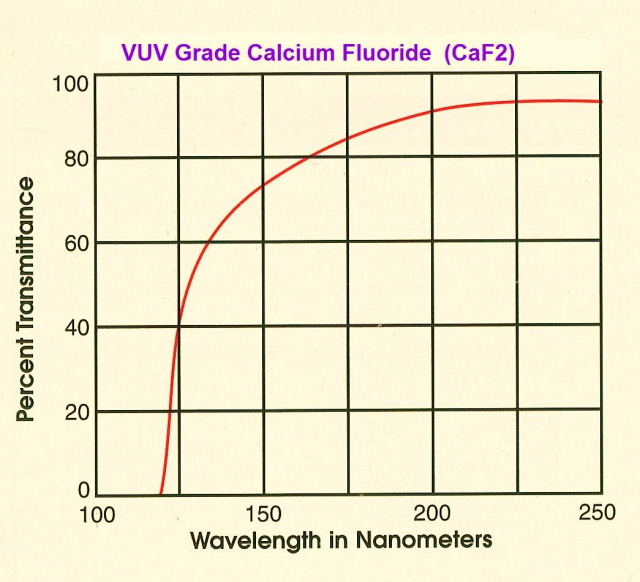 Calcium Fluoride: Calcium Fluoride (CaF2) exhibits good transmission properties from ~ 140nm Vacuum UV (VUV) to ~ 8.0um in the Infrared. CaF2 is a relatively soft crystalline material and care should be taken as CaF2 is sensitive to mechanical and thermal shock. CaF2 is a cubic single crystal optical material. Sapphire: Sapphire (Al2O3) exhibits good transmission range extending from the ~ 150nm Vacuum UV (VUV) to ~ 5.0um in the Infrared. Sapphire is an exceptional hard material and can only be scratched by a few materials other than itself. Sapphire is chemically inert and insoluble to water, common acids, or alkalis at temperatures up to ~1,000 °C. Sapphire is typically oriented so that the c-axis of the crystal is parallel with the optical axis. 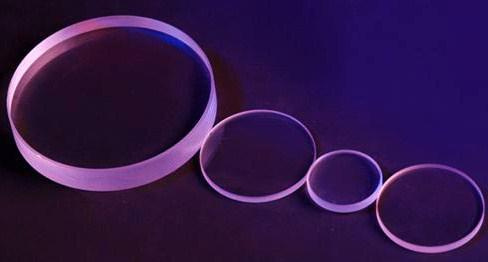 VUV to UV Optical Windows are flat polished round VUV to UV optical windows typically used in general VUV-UV applications such as Deuterium (D2) Lamp and VUV to UV Laser Sources to isolate environments while allowing short wavelength VUV through UV light to transmit as short as 120nm. VUV to UV Optical Windows are generally used for view ports or sealing and or protecting other components within an VUV to UV optical assembly, VUV to UV instrument or VUV to UV laser. More information can be found on our Material Properties Page. For more information about Optical Windows, refer to our Optics Tutorial page. Please visit our "Windows Sale" Link.